In 2012, 93 years of a life dedicated to the family company founded by his father Marius, Paul Berliet died in Lyon. A man of the people, modest, optimistic and energetic, Paul Berliet returned to the company in 1949 following his rehabilitation. Faithful to the principles of his father who had set up fully vertical production, from the metal to the finished vehicle, he strived to develop the company through innovation and export. In 1962, he created a research and development centre from which originated inventions such as 'airlam' (pneumatic suspension), low-floor buses, advanced cabs, etc. He decentralised production in the Rhône-Alpes region, set up plants abroad and created 16,500 jobs between 1950 and 1974. After the merger to form Renault Industrial Vehicles (RVI) in 1978, Paul Berliet launched a new project. 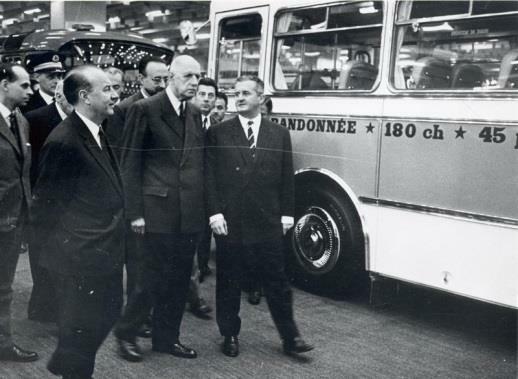 In 1982, he created the 'fondation des automobiles Marius Berliet' (Marius Berliet Automotive Foundation) the aim of which is to preserve, safeguard and enhance the past of the car and truck (bus, coach). Book : Bollon-Mourier, Paroles d’un entrepreneur, Paul Berliet entretien avec un constructeur automobile , Delibreo, 2008.